Travel writer Julia Hammond has been travelling solo for three decades. Here, she shares her top tips. Solo travel is a fast-growing trend. According to ABTA, one in nine holidaymakers has travelled alone in the last 12 months. Hotel booking sites and Airbnb have reported a large increase in solo travel too, and cruise companies have started building more solo cabins with no single supplements. Knowing yourself is a big part of having a successful solo holiday. While some relish solitude, others find it lonely and isolating. Test out how you’d cope with a big trip by first booking a weekend away in a familiar location. Punctuate your itinerary with opportunities to connect with fellow travellers. For instance, try a Free Tours by Foot walking tour—they operate in a number of European and North American cities. Alternatively, book a place on an activity-based break where you learn a language, cook, or paint. Once you’ve got this trial under your belt, you’ll be better equipped to decide whether you’d prefer the safety net of a group tour or if you’re ready to spread your solo travel wings and go it alone. Embrace the chance to make this holiday all about you. Pick a place you’ve always wanted to explore but that your usual travelling companions would hate. Perhaps this solo trip could be the opportunity to volunteer with a charitable organisation overseas. Another idea is to set yourself a physical challenge such as climbing Kilimanjaro. Of course, there’s nothing wrong with doing the complete opposite. If you’ve danced until dawn and find yourself lounging around in your pyjamas late into the afternoon, there’ll be no one around to nag you to get dressed! Hostels, with their communal kitchens and common room social activities, are a great way of meeting people. The days of being forced to endure smelly dorms are long gone, and many hostels now have ensuite private rooms which are as comfortable as a hotel. However, solo travel doesn’t have to mean backpacking. Airbnb offers a good selection of both shared and single occupancy units, with the advantage of having a local host on hand for insider tips. Boutique hotels with their ‘home away from home’ ethos can be a real treat. Why not pick a good value destination where your money will stretch further and indulge yourself with a suite or room with a view? For example, I stayed at Hostal Plaza Santa Cruz in Seville in an absolutely enormous suite right in the heart of the old town for 57 euros. It’s a sad reality that the world isn’t always as safe as we might like, and some novice solo travellers might feel vulnerable without the safety net of a tour guide or travel partner. Before you book, you can ask questions internet forums such as Lonely Planet’s well-established Thorn Tree network. Use it to work out the safest neighbourhoods in your intended destination. Once there, make use of social media to ensure someone back home knows your plans. Pre-book airport transfers if you’re arriving late; check locally if it’s safe to flag a taxi down off the street. Keep your phone charged and your wits about you. But trust your instincts: remember, it’s often those unexpected encounters with welcoming strangers that make the longest lasting memories. Freelance writer Maria John explains how she discovered Salzburg to be her favourite place in Europe. I’ve travelled to many cities in Europe, including classics like Prague and Zurich. Yet everyone is surprised when I say that my favourite city is Salzburg. To get to the fortress, you first have to go to the old town, where everything likes to remind you of its famous alumnus, Mozart. Live music accompanies you as you venture into the main square, filled with mini-attractions. 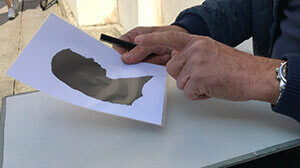 There’s a man who’ll craft a shadow portrait of you: he cuts black paper into the silhouette of your face, replicating an 18th century style, then pastes it onto white paper as you can see in the photograph I’ve included here. You’ll also find souvenirs to be purchased, and a fantastic giant chess board painted onto the ground along with giant chess pieces. The fortress sits on a hill and is accessible by the Festungsbahn, a 325 foot high funicular railway that can hold 50 people. The ride is just under a minute, but you’ll wish it was longer as you enjoy the views of the city as it drags you up the side of the hill. It was around 3pm by the time I was at the top, when the sunlight was at its best. The view takes your breath away as you gaze at the greenery and trace the river as it runs between the tiny colourful houses that are a testament to Austrian architecture. In the vaulted former gun deck of the fortress you’ll find the Marionette Museum. A few of the puppets are strung up, while the pretty ones are kept inside glass cages. Some depict characters from the Sound of Music, others tell you of past peasant wars, one to help enjoy your own little puppet show, and another for laughs: a skeleton with a long beard who pops up behind a coffin door with a maniacal laugh. A glass pane lets you peek into the room beneath you that’s filled with millions of coins of varying degrees of gold and silver. The Regency Chambers or State Rooms have a lot for you to talk about. The Golden Hall looks like something straight out of a film, with its four large marble columns leaving you in awe, especially when you see the amount of space set aside for an orchestra. The wooden floors creak as you take each step, as you take in the rare gothic architecture. Although us peasants couldn’t possibly have had such an extravagant bathroom at that time, the toilet in the bedchamber is simply a hole carved into a wooden ledge—a shocking contrast to the opulence of the main room! You’ll still be impressed when you head off to the Rainer Regiment Museum, allowing you to uncover just how prominent Salzburg was during the wars. Room after room recreates these times. One particularly impressive room recreates a war station from WW1, others recreate the battleground with life-size statues and barracks, with music from that time playing in the background. Other rooms include relics of the past, including musical instruments, large paintings, and furniture from the Middle Ages: tapestries, elaborate trunks, jewellery boxes, and dining room essentials. The kitchen has a 16th-century table stove and utensils hanging from the wooden ceiling frames. Its long-handled frying pans, mortars, and large jars are preserved for viewing, impressing upon you the strength the kitchen staff would have needed for their work. When you get out after a couple of hours, you’re back in the 21st century, a little jarred from the time travelling that you just did. If you need a break after all that walking, I recommend the entrance cafe where you can try a slice of Sachertorte, a decadent Austrian chocolate cake filled with apricot jam that you can wash down with some beer. So why not make 2019 the year you visit Salzburg and experience all of this for yourself? Touring stand-up comic Terry Norman tells us about his recent visit to Haarlem in the Netherlands. As a somewhat successful stand-up comic, I’ve been to a lot of places. This past December, I gigged in Haarlem, often jokingly described as the Brooklyn to Amsterdam’s Manhattan. While Brooklyn and Manhattan are boroughs of New York City, Haarlem is a city in its own right. However, being a mere 15-minute train ride from the capital means it is generally written off as part of Amsterdam. This is a common source of frustration for the locals. By the time I left the city, I shared this frustration, along with the belief that it is Haarlem, and not Amsterdam, that is the jewel in the Dutch crown. When Haarlem was pitched to me as a possible stop on my European tour, it was presented as historically and culturally rich. Like Brooklyn, independent cafes line its corners and are themselves lined with poets and painters. I was sold. I had performed in Amsterdam enough times by this point to have tired of its nightclubs and stag parties. Haarlem sounded like the antidote. Travelling to Haarlem from Britain means flying into Schiphol Airport. A train from the airport to Haarlem takes 30 minutes and costs about £10. If you want to see some of Amsterdam before remembering why you chose Haarlem instead, you can take an airport train to Amsterdam Centraal, where trains to Haarlem run until 1am. For my stay, I chose the Hotel Carillon, a modest establishment where I paid just under £70 per night. The Hotel Carillon is pretty basic, so if your trip lasts more than a weekend you should consider somewhere like the four-star Carlton Square, where rooms are about £150 per night. Among the most notable of Haarlem’s sights is the Grote Kerk. A breathtaking 15th-century church, the Grote Kerk sits at the centre of Grote Markt, its grand attraction being a 5,000-pipe Müller organ on which recitals are regularly performed. Constructed all the way back in 1355, the Amsterdamse Poort is the last remaining gate of Haarlem’s 12 city gates. I saw it as part of a walking tour, but canal and bike tours are also available. The canal tours are particularly popular among older holidaymakers. Haarlem boasts a selection of museums, with Teylers Museum being my personal favourite, largely owing to its variety. A museum of art, science, and natural history, Teylers is firing on all cylinders. Haarlem is a city of many sights and sounds, all of which combine to create a truly marvellous atmosphere. The locals play their part in this too: Haarlem residents are obliging and eager to show newcomers around, ensuring you experience the full charm of their hometown. Do you want to navigate the streets of Madrid with the ability to ask for directions in Spanish? How about being able to bond over a beer in perfect German with a local? Perhaps you want to impress your friends by ordering a petit croissant with a flawless French accent? Whatever your reason for wanting to learn a new language, it can be a rewarding and fun experience. Here are some tips to help get you started. When learning a new language for the first time, it’s easy to imagine yourself as a child learning to talk. Children don’t understand the basics of grammar, and they certainly don’t use perfect tenses first time around. When learning a new language, it’s important to try and forget what you already know about English. That knowledge won’t come in useful here as every language has its own grammatical structure that is often different from your own. Act like a child and start from the beginning with the basics. And, like when talking to a child, speakers of other languages won’t get upset or angry if you make mistakes: they’ll be pleased that you are making an effort! Studies show that learning a new language for ten minutes every day is more effective than going to a class once a week. This does not mean that your language class isn’t valuable, it simply means that you have to do your homework and put in the extra work. There are a number of apps available for you to use when studying. Duolingo is a fun, free app that treats language learning like a game. You can set up reminders every day at a certain time, and you can even set how many minutes a day you’d like to practice. If you want lessons over the internet where you talk one-on-one with a native speaker, try italki. Lessons there start from around US$10-20 (around £7-15) per hour. You can also use Google Translate, a free website which also has a free mobile app, to translate phrases and hear them spoken by a computer voice. It’s not perfect, but it can help to get you started or help you if you are struggling. Staying motivated to learn a language is difficult when you’re not excited about it. Learning a new skill doesn’t always have to mean textbooks and memorising vocab words all the time. One way to stay engaged is to keep it fun. Watch foreign films and TV programmes with English subtitles; you’ll be amazed at how many are available on streaming services such as Netflix. Buy foreign magazines at your local airport and see how many words you recognise. If you love cooking, you could attempt following a recipe in another language by searching for one online. Why not start listening to music in the language you’re learning? There are so many creative ways you could incorporate your new language into your everyday life, ready for your trip to your chosen country. Sometimes learning a language can become overwhelming. If you find the process boring, change your methods and make it fun again. If you find it too difficult, give yourself a break and go back to the basics. If you’re struggling to stay motivated, remember why you embarked on this journey to begin with. The important thing to remember when learning a new language is never to give up. You’ll get there eventually if you stick with it, and once you do, an entirely new world of conversation will be open to you.